Implementing municipal policy for the protection of historic resources can take many forms and can involve different types of measures. Developing Historic Resource Protection Standards are one type of implementation method. Often these standards are adopted in zoning, subdivision/land development, or local historic district ordinances, and can vary depending on the historic resources they are addressing, their context, municipal policy, political climate, and other factors. PA Act 247, the Municipalities Planning Code (MPC), provides the legislative basis for historic resources protection using local land use controls including zoning and subdivision/land development ordinances. There are several applicable sections of the MPC including §603(b)(2) "Zoning ordinances may permit, prohibit, regulate, restrict and determine [among other provisions]…size, height, bulk, location, erection, construction, repair, maintenance, alteration, razing, removal and use of structures…" and §603(g)(2) "Zoning ordinances shall provide for protection of natural and historic features and resources." In Chester County, the MPC has often been applied to protect historic resources through the adoption of municipal-wide historic regulations and an overlay zoning district. However, other incentive measures have been implemented though zoning in some municipalities; for example, allowing additional uses for historic resources in order to promote their adaptive reuse and continuation. A local historic commission is created under the Township or Borough Code, often in coordination with zoning regulations and to provide additional assistance to local officials. Municipalities can adopt historic resource protection standards pursuant to PA Act 167, the Historic District Act, which authorizes local governments to enact ordinances to regulate the construction, alteration, restoration, and demolition of buildings in certified local historic districts. While MPC regulations largely focus on community character and land use-oriented protection measures, Act 167 regulations focus primarily on preserving the physical aspects of the historic built environment and the historic landscape and its context in a defined area of a historic or conservation district. 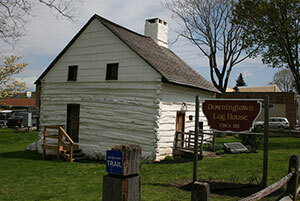 Local historic districts and ordinances created under Act 167 are certified by the Pennsylvania Historical and Museum Commission, and administered at the local level and with the assistance and recommendations of a local historical architectural review board. In Chester County, Act 167 has most often been applied to preserve the character, context, and architecture of key historic areas in towns and villages. Act 167 is often incorrectly associated with strict architectural and aesthetic design requirements such as detailed building elements and color limitations; in fact, the enabling legislation is written broadly and provides significant amounts of flexibility and latitude when developing regulations. Requiring certain limited building colors and the like is not a requirement of the Act. Preserves Existing Community Character and Building Stock: Historic Resource Protection Standards can build onto and continue the existing community fabric for future generations. Preserving historic resources and areas and encouraging complementary new development contributes to a community's overall vitality and continuity. Protect Historic and Cultural Resources and Landscapes: Historic Resource Protection Standards can be used to protect identified historic and cultural resources and landscapes. Flexible Preservation Opportunities: Historic Resource Protection Standards can provide a flexible and incentive-based approach to encouraging preservation. Supports Property Values: Historic Resource Protection Standards can encourage general maintenance and upkeep, as well as rehabilitation and adaptive reuse. Energy Conservation: The reuse of the "embodied energy" contained in a structure's materials, e.g. brick, timber, concrete, etc. represents energy conservation. Reduces Development Pressure on Greenfields: The protection of historic resources can conserve energy and reduce the development pressure in outlying areas. Economic Growth: Economic growth can be encouraged through the preservation of historic resources, especially in urban areas. Environmental Benefits: The reuse of historic resources can provide environmental and public-health benefits through the remediation of contaminants associated with some older building materials as well as former industrial or commercial sites. Protecting Property Rights: Balancing property rights with community goals can be a challenge. Regulating certain property rights is often necessary to achieve overall local historic preservation goals, while the benefits are shared by the owner and community as a whole, potentially creating tension between the two groups. Subjectivity: The relative merits of certain architecture and other features can be debated among those who hold differing viewpoints. Regulatory Challenges: Interpretation of ordinance provisions and the uniform application of design standards can be a regulatory and administrative challenge, particularly for new Historical Commission or HARB members and changing elected and appointed local officials. Perceived Limited Benefits: Historic Resources Protection Standards, as an element of overall municipal planning, can be perceived as having only limited benefits when its benefits are not widely understood or accepted, creating potential opposition. Broad input from the municipality is needed to achieve public consensus about the type and extent of appropriate historic resources protection measures. Municipal historic commissions or other similar entities or parties should be invited to the discussion, guidance and recommendations as well as to serve as liaisons to the community at large. PA Act 167 enabling legislations offer local governing agencies significant latitude in structuring historic preservation ordinances that are appropriate for their municipalities. Municipal-wide historic resources zoning regulations that are created under Act 247 and certified historic districts created under Act 167 are some of the most effective ways of protecting historic resources in Pennsylvania, and have been used throughout Chester County. Inventory Historic Resources: Before regulations can be developed, a comprehensive historic resources survey of properties along with in-depth definition of the area's historic character is needed to obtain information on the extent, nature, and location of historic and cultural resources and landscapes, and to delineate historic and/or zoning district boundaries or extent. Ideally, this survey would occur as part of the community-wide comprehensive planning process because the identification, documentation, and evaluation of historic resources are the foundation for local preservation planning. Comprehensive survey forms, preferably using PA Historical and Museum Survey Forms for consistency, establish the basis for local resources protection standards. Foster Citizen Participation: The most successful historic preservation programs are those with a high degree of citizen support. Public input and active citizen participation is critical for the successful development, adoption, and application of local regulations. It provides local officials an understanding of the level and type of current municipal support for historic resources protection. It also creates a forum in which residents, property owners, businesses, and other stakeholders can become aware, involved, and provide input about historic preservation issues and concerns. Because the establishment of historic resource protection regulations can effect an owner's future changes to a property, it is particularly important that the municipality understands the goals of preservation and how protecting historic properties can benefit the municipality as a whole as well as individual property owners. For example, building activity is usually monitored by the building permit process, and in the case of Act 167 regulations, applications for permits within an historic district are first reviewed by the Historical Architectural Review Board, which then makes a recommendation to the local governing body that makes the final decision on granting the permits. Ordinance Preparation: The ordinance must define the historic resources and area to which standards will apply using a map and a related inventory, as well as establish the review processes, standards or criteria used for review, the governing body determination and reporting process, and the appeals process and related penalties. Regulations related to historic resources that are adopted pursuant to the MPC typically became part of the municipal zoning ordinance and/or the subdivision and land development ordinance. Act 167 regulations are typically designed as an independent ordinance, or in some cases are placed in the zoning ordinance to ensure their incorporation and compatibility with other related municipal standards. The approach chosen will determine the final format. In the case of Act 167 regulations, the appointment and duties of the historical architectural review board are also defined within the ordinance. Likewise, while municipal historical commissions are authorized under the Township or Borough Code, in some cases their enactment regulations are placed in the zoning ordinance for ease of reference and consistency with other historic resources standards. Ordinance Adoption: Historic resource protection standards developed under the MPC are adopted following the specific requirements in the MPC for zoning, subdivision and land development ordinance, or other measures. For Act 167 standards, first the local ordinance is adopted by the local governing body and then it and related background information on the historic district is submitted to Pennsylvania Historical and Museum Commission for review and certification regarding Act 167 requirements. After notification of certification, the governing body can appoint the historical architectural review board members and implement the ordinance. Relationship between MPC and Act 167 Regulations: In developing historic resources protection standards under Act 247 or Act 167, it is important to ensure that the zoning ordinance or subdivision and land development ordinance and the historic district act ordinance complement one another. Even though the regulation of a certified historic district may be included as part of the zoning ordinance, these regulations can address the physicality of structures in a historic district, while their use and lot dimensional standards are regulated under the zoning ordinance. Problems can result if the provisions affecting a structure's physical elements conflict with the permitted use or other requirements for the structure. Deliberate care should be taken when developing regulatory measures to ensure that the provisions affecting historic resources are complementary. Review Criteria and Design Guidelines and Standards: The use of review criteria and design guidelines and standards, both for guiding alterations to existing structures and in evaluating plans for new construction, is important for the effective administration historic resource protection standards. Requests for building, demolition, and zoning permits cannot be appropriately evaluated unless they can be objectively measured against an adopted standard. To assist the Historical Architectural Review Board or Historical Commission in evaluating review requests, and to help property owners comply with the ordinance, municipalities should define the review criteria and develop or adopt design guidelines and standards. Adopt a common vocabulary to describe design issues: A set of design guidelines that uses consistent terms and is written in an understandable manner will help ensure wide public acceptance and support. Define the present day character: The present character of a historic area can best be defined in terms of land use and building types. This analysis should focus on building styles, architectural components, construction materials, landscaping, and related areas. Define the historic character: The historic character must be defined in order to understand the relationship between the past and the present. Compare present and historic characteristics: After the present character and the historic character are defined, they can be compared and the integrity of the historic district can be created. This will also help identify the types of guidelines that need to be adopted to protect the important historic characteristics. Forecast future character: Before appropriate guidelines can be identified, development trends must be assessed. By comparing the likely types of future development to the type of development that the municipality desires, appropriate design guidelines can be created. A property should be used for its historic purpose or be placed in a new use that requires minimal change to the defining characteristics of the building and its site and environment. 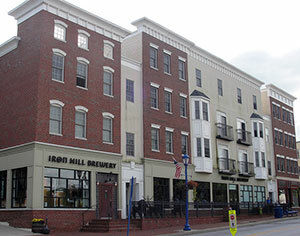 The historic character of the property shall be retained and preserved. The removal of historic materials or alterations of features and spaces that characterize a property shall be avoided. Each property shall be recognized as a physical record of its time, place and use. Changes that create a false view of historical development such as adding features with no historical precedent shall not be undertaken. Most properties change over time; those changes that have acquired historic significance should be retained and preserved. Distinctive features, finishes, and construction techniques that are examples of craftsmanship that characterize an historic property shall be preserved. Deteriorated historic features shall be repaired rather than replaced. When the severity of deterioration requires replacement of historic features, the new features shall match the old in design, color, texture and other visual qualities, and where possible, materials. Replacement of missing features shall be substantiated by documentary, physical or pictorial evidence. Chemical or physical treatments, such as sandblasting, that cause damage to historic materials shall not be used. Significant archeological resources affected by a project shall be protected and preserved. New additional exterior alterations or related new construction shall not destroy historic materials that characterize the property. The new work shall be differentiated from the old and shall be compatible with the massing, size, scale, and architectural features to protect the historic integrity of the property and its environment. New additions and recent or related new construction shall be undertaken in such a manner that if removed in the future, the essential form and integrity of the historic property and its environment would be unimpaired. West Chester Borough's Historic District is included as Article XI of the Borough Zoning Ordinance. Additional information on the Borough's historic preservation efforts is available on the Borough's website. Birmingham Township includes the unique village of Dilworthtown. This village is located at a five-point intersection and still contains many buildings from the 18th and 19th centuries. To preserve this village and the historic Birmingham Road corridor stretching to the north, the Township adopted the Birmingham Township's Historic District Protection Ordinance of 1993 and a set of design guidelines to be used to determine the appropriateness of proposed changes in this district. Guthriesville is an historic village located on State Route 322 in East Brandywine Township. The East Brandywine Township Historic Resource Protection Standards are included in Article XII of the Township Zoning Ordinance District. Thornbury Township, which contains Revolutionary War battlefield sites, includes a Historic Battlefield Overlay District in the Township Zoning Ordinance. West Whiteland Township has adopted historic resource protection standards. 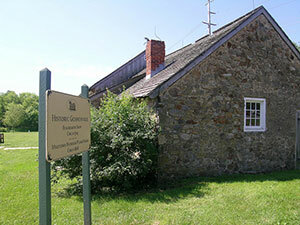 West Whiteland Township's Historical Commission assists the Township in historic resources related matters (e.g. maintaining a historic resources survey and inventory including the Township Historic Resources Map, reviewing applications for rehabilitation, enlargement, or alteration of historic resources for compliance with the Secretary of the Interior's "Standards for Rehabilitation and Guidelines for Rehabilitating Historic Buildings," providing advice to Township officials). West Whiteland Township's historic preservation standards are located in the Township Zoning Ordinance.